Bringing in the picturesque of Madhya Pradesh with a perfect blend of patriotism, the ATG Media has roped in the artistes of state spreading the charisma of National Anthem. With an aim to feature the maestros of the Central India, the video has both instrumental and vocal artistes tuning together to perform the national anthem. The artistes include ace Sitarist Smita Nagdev, Santoor maestro Shruti Adhikari and her son Ninad Adhikari, Padmashri Ramakant Gundecha and Umakant Gundecha, Padmashree Prahlad Tipaniya, Sarod maestro Aamir Khan, Pt. Sajjanlal Bhatt, noted vocalist Ullhas Telang, Bhuvnesh Komkali, Pt. Ajay Pohankar, Meeta Pandit and Sarangi maestro Hanif Hussain. Shot on various beautiful locations of Bhopal, the state capital of Madhya Pradesh, Bhopal, this video includes the places like Manuabhan ki tekri, Amargarh Fall, Shaurya Smarak, Dehlabadi fort, Kaliyasot dam and Sheetaldas ki bagiya. In a candid conversation with Newscrust, the artistes speak on their experiences while shooting for this video. Whenever I hear the National Anthem, I get goose bumps and I get tears in my eyes. The feeling is actually amazing. It is a mixture of pride and happiness. When the ATG approached me with this proposal, I was overwhelmed because I could get to play our National Anthem. My location was Manuabhan ki Tekri, so I went there with their team. The place where I was seated was very near to the edge of a cliff on a rock at the Tekri. We chose to shoot in the evening since the view of the sunset from here is beautiful. 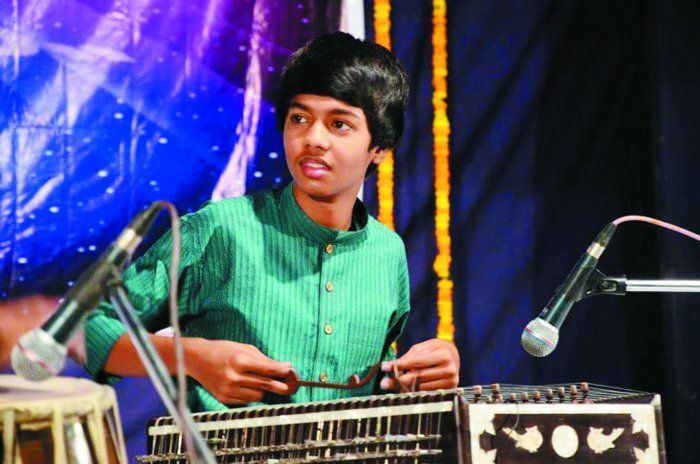 When I was asked to play, I was so scared because behind I could see a valley behind me and I had a constant fear that I would fall, if I moved while playing Sitar. But the moment I started playing Jana Gana Mana, all was forgotten and it was only my instrument, the National Anthem and me. It was an amazing experience indeed. For me this video is very special. One, because I was playing the National Anthem, and second because I was playing it with my son Ninad. We were shooting at the Amargarh falls and reaching the shooting location was an adventure for us. It is located near Budni ghat is and is approximately 8 kilometres from the main road. The condition of the road was so bad that from the main road to the fall we had to travel through a tractor and then cross the fall and then perform. It was so thrilling. It was an adventurous and a soothing experience for me. The motive behind this video was National Anthem and it said it all. The moment they approached us, we both decided it to make it a special experience for both my mother and me. We were chosen to represent our state and our nation. It was surely a moment of pride for me and a moment of respect because I have performed it with my mother. Since I am a student of mass media as well, I chose to be in the production tem as well. I was a part of the cinematography team and the direction team. It took us a total of more than 20 days to complete the video. I got to learn as an artiste and as a mass media student both, during the making of this video.